Bob Katz, author of the "bible" on mastering audio "Mastering Audio: The Art and the Science", just recently released a new book that exclusively deals with Apple's "Mastered for iTunes" program. Mastered for iTunes (MFiT) is a program initiated by Apple to enhance the audio quality of recordings available through iTunes. In my previous blog post you can read about what said program entails. Put simply, it's a great initiative and one that we as engineers should embrace, right now. Bob's book comes across like a trusted friend and colleague who gives you an informative tour, making sure that you, and with that, your clients get the most out of the MFiT program. Broken down in 7 chapters, Bob will guide you through the whole process from assembling the album, over picking the right resolution (16, 24, 32 bits), the effects of lossy (AAC) coding, loudness and levels (3 chapters on this topic alone, I applaud this tremendously!) and finally on the tools you need (good news, most of them are cheap or even free!). It's hard to sum up some of the great things about this book because I feel I would end up just copying over the entire book. Yes, a lot of it, if you're an audio or mastering engineer, you have heard about before on forums, AES talks, discussions with colleagues etc. But just like Bob Katz's book on mastering did of putting *ALL* the relevant information together, so does this book. I felt like I was continuously discovering little bonus tracks on a great album, for example in one case Bob describes receiving, what appeared to be, a clipped 32bit audio file but then explains why this is not as big a disaster as it first looks like. In another case Bob describes Sound Check as a country song backwards (no spoilers, read it yourself, but I was laughing out loud for some time). Once you've read through the ~110 pages, not only will you feel like an expert on this topic (which is a rare feat for a book of this size) but Bob also asks you to join him at Digido's portal for iTunes Music which contains a whole host of links and a forum which Bob himself is active on. It's a bit quiet there at the moment and the website can be painfully slow (at least from Germany) but it's definitely something to keep an eye on and have the opportunity to ask the master himself! What the book doesn't answer though (but apparently Bob hopes for, just as much as I do), is whether or not Apple will allow us to have Sound Check work on a per album instead of a per track basis as well. Apple has hinted at this in their own documentation and I was hoping Bob would know more about it (I'll have to ask on the Digido forums which I haven't gotten around to doing yet) but I feel it's inevitable. This is a must read for everyone working in audio who's work will end up on the iTunes Store (so basically everyone)! 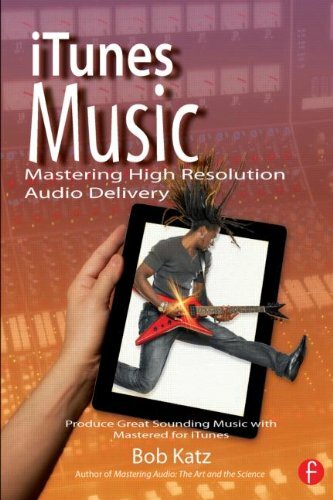 You will not get the knowledge required to make great masters for iTunes any easier than by reading this book. IFPI's response to EU piracy study - Really?! ?